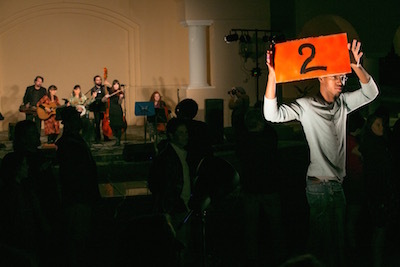 In February of 2009 New Music New College attempted a rather audacious undertaking: a concert involving fifteen musicians and eight dancers, presented outdoors on three stages surrounding the audience. Principals from the Sarasota Orchestra (tubist Jay Hunsberger and double bassist John Miller) played with and as part of New College student rock/punk bands (The Done For, Tyger Beat, and Skeleton Warrior). And to end the concert musicians on all three stages, led by Stephen Miles on guitar and joined by R. L. Silver on synthesizer, played a re-orchestrated version of The Rite of Spring as dancers from Fuzión (now Sarasota Contemporary Dance) wove through the audience. Because the heart of this concert was the collaboration and interaction between musicians of very different backgrounds, we called it "Crossroads." The response to this experience, from both audience members and participating musicians, was so positive that we decided to present another Crossroads collaboration the following year. And a third one the year after that. And so on, eventually leading to five Crossroads concerts. For Crossroads 2 on February 26, 2010 Hunsberger and Miller joined us again from the orchestra, Tyger Beat returned, and a new New College band, Physical Plant, took part, along with New College students Joohyun Kim and Alexander Salisbury, who did piece where they electronically processed the sounds of Hunsberger's tuba. Like the first Crossroads three stages were set up with the audience in the middle, and for the finale musicians played on all stages at once—this time, for Frederic Rzewski's entropic Les Moutons de Panurge. The audience's freedom to move throughout the space, especially as the performers in the finale engulfed the space with sound, gave an agency that echoed some of the similar (though indoor) stagings NMNC has done with the Cage Song Books. And also extending agency to the audience, composer/performer/polyartist Francis Schwartz conducted musicians and the audience in his theatrical Cannibal-Caliban. Crossroads 3 was held on March 4, 2011. For this year's concert the finale was written expressly for the players in this space, by NMNC Producer R. L. Silver. Noticing that during the finale of Crossrads 2 a group of audience members began trotting in a circle in the center, so as to hear the sound from each stage sequentially, Silver composed a piece wherein a simple chromatic theme was passed from stage to stage thereby encircling the audience. He called it Spin Cycle. We expanded Crossroads 4 into a two-concert event along with a panel discussion and called it The Meeting of the Minds Festival. Along with our now-regulars from the Sarasota Orchestra and New College student groups Physical Plant and NEW Ensemble (inspired by NOW Ensemble, who were NMNC visiting artists the previous season), the players were joined by the experimental jazz group Fluid Motion. Fluid Motion (David Manson, trombone; Jonathan Powell, trumpet; Jeremy Powell, saxophones; Ronnie Burrage, drums; and Doug Matthews, bass) performed on their own on Friday night, a concert that paid homage to the recently departed Sam Rivers. On Saturday afternoon Ronnie Burrage, along with bell hooks and George E. Lewis participated in a panel discussion, "The Politics of Race and American Experimental Music." And on Saturday evening all the musicians presented a concert that culminated with another piece composed expressly for Crossroads, Francis Schwartz's Cooking at the Crossroads with Pauline and John, inspired by Schwartz's friends Pauline Oliveros and John Cage. 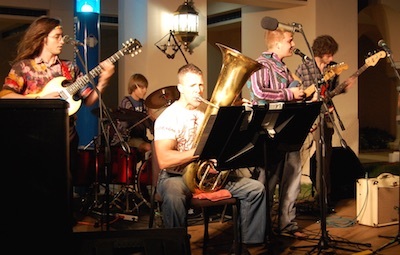 Our fifth iteration was 2013's Crossroads 5: BluesX, with bluegrass band Passerine, trombonist David Manson, New College student band The Antiquarians, and the Open Instrumentation Ensemble, an eclectic group of student players directed by professor Mark Dancigers. The finale for this concert was John Zorn's game-like Cobra, with a "Prompter" in the center of the space directing the players at each stage in a number of musical gestures. We then decided it was time to move on from the Crossroads concept, but some of the influence of those experiences lived on in other concerts we have presented in New College's PepsiCo Arcade, especially 2014's DIY (for Do It Yourself) concert and 2015's presentation of Terry Riley's In C where we had musicians on all four sides of the audience, who were free to move around.